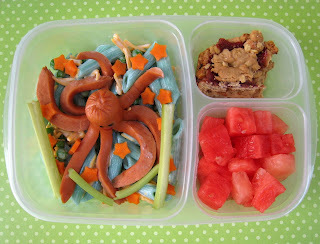 BentoLunch.net - What's for lunch at our house: Ben's Octo Bento! The boy is really missing his sister while she's at camp. He is not used to being the only kid and doesn't seem to enjoy it, especially with no one to play with. We did go to taekwondo last night, in order to give him something to do, so I made him a special bento just because. I've seen octodogs on other bento blogs many times in the past and always thought I should try them. So I did. Ben was happy. Ben has an octodog sitting on a bed of blue pasta salad with carrot starfish, peas, & a few celery (seaweed maybe?). He has watermelon chunks and a few pieces of strawberry oatmeal bars. It's all packed in his EasyLunchbox. A close-up of the octodog! I added his facial features with Wilton Food Writer Edible Color Markers . I always find these octodogs totally hilarious! Mostly cause I'm terrified of octopuses (octopi?) 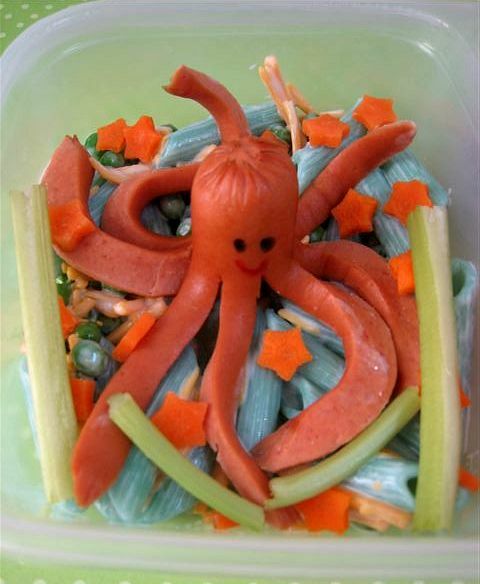 but how can you be afraid of something so cute as an octopus shaped hot dog? This is a particularly friendly looking octodog :) Great color combinations too! That is just so cool! What a wonderfully creative lunch. How long does a typical 'designer' bento take you to make? Actually, very little extra time. The pasta is dyed in the boiling water, so that took 0 extra minutes (I threw about 3 drops of food coloring into the kettle of water). The octodog was presliced (4 cuts), then tossed into pot of boiling water #2. The smile was only drawn on quickly with food markers. The longest part was a minute or two slicing the carrots, but I used a cookie cutter for it. Most stuff I make is pretty simple, I'd only estimate spending an extra 5 or so minutes (on and above making it as a normal not-cute lunch).